The fact that the Sapa tribes continue to live a very basic existence is partly economic and partly cultural. To them, a rice field, a garden, some cattle and a stilt house are all the prosperity they ever hoped for, going back countless generations. 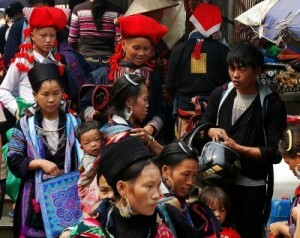 The fact that the Sapa tribes continue to live a very basic existence is partly economic and partly cultural. To them, a rice field, a garden, some cattle and a stilt house are all the prosperity they ever hoped for, going back countless generations. Homestays in these same stilt houses are very popular, of course, though some villages are more ‘authentic’ than others. The most-easily accessed destinations feel more like ‘theme resorts’ for tourists, where they get to rough it local-style, though technically they are real villages. But if you venture to the more remote hamlets, they offer fascinating glimpses of lifestyles seemingly stolen from history. Life is probably better for the tribes than it once was, but it still takes all day to make a few dollars profit. Despite the steady flow of tourists, supply far outweighs demand. You may notice that if you wander beyond the last tourist-oriented business on any street, there are precious few businesses thriving on local dollars alone. In a sense, it’s not really a town at all — the tribes live elsewhere and come into town to do business — often trudging along on foot for hours — or nowadays just as likely to jump on the back of a motorbike . The ethnic Vietnamese, for their part, are from other cities in Vietnam. Many live in cheap, shabby rooms but it still takes a lot of postcards and sweet potatoes to make the monthly rent. And there are few other options: other than family farming, since there are no major industries in the area aside from tourism.